Last month, Singapore ride-hailing company Ryde lodged a police report regarding the creation of close to 300 fake accounts and 2,000 “phantom” RydeX trip bookings on its platform, which resulted in a S$50,000 loss. What’s even more appalling is that the firm found “compelling digital evidence” that point to IP addresses with locations in Midview City and The Herencia. Two Grab Driver Centres are located at these two areas, and one IP addresses is even confirmed to be registered under Grabtaxi Pte Ltd. In response to this news, a Grab spokesperson told Vulcan Post that “Grab is investigating the matter”. Fast forward a month later, there still has been no updates from them and today, another similar Grab fiasco was reported. This time round, the victim is Philippines-based ride-hailing company Micab. Micab CEO and co-founder Eddie Ybañez has contributed an article on e27, sharing that its internal investigation points to Micab’s rival, Grab. 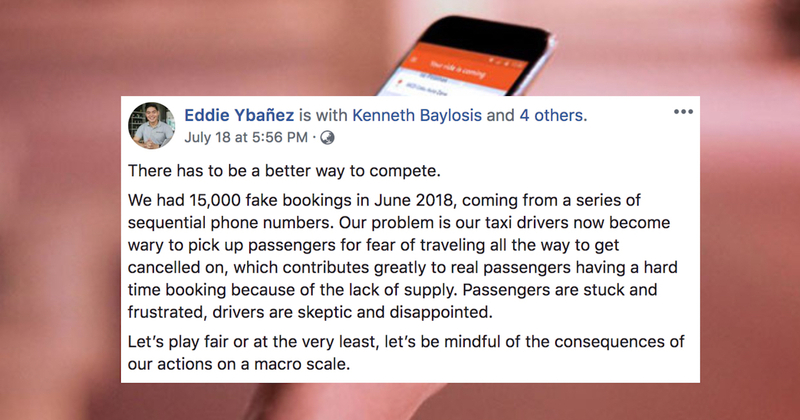 Our taxi-hailing platform, Micab, which competes directly with Grab’s GrabTaxi and indirectly with their private car hailing services, has also been hit with a firestorm of phantom bookings, albeit with a slightly different modus operandi. “After booking one of our cabs, then waiting as usual before canceling, our drivers will receive a call a few minutes later inviting them to a driver’s orientation for Grab,” he wrote. Due to these slew of phantom bookings, Micab drivers are now hesitant to accept passengers from their platform. “Our taxi drivers now become wary to pick up passengers for fear of traveling all the way to get cancelled on, which contributes greatly to real passengers having a hard time booking because of the lack of supply. Passengers are stuck and frustrated, [and] drivers are skeptic and disappointed,” he wrote separately on his Facebook post.